Welcome to Avra Beach Resort Hotel & Bungalows! A tailor-made A' Class complex that awaits to welcome its guests to Ixia, a cosmopolitan summer resort. Within easy reach of the commercial district of Ixia, recently renovated and by offering well appointed facilities, our resort embraces every need of our customers. The highest level of personalised service makes it a prized address for those who seek the best family resort in Rhodes. 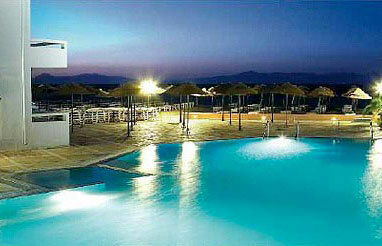 Avra Beach Resort Hotel-Bungalows is rising the standards for holidays in Greece! The hotel bungalow appartments Avra Beach Resort is situated on the beach of Ixia, 6km west of Rhodes town and 7km from Rhodes International Airport. The hotel covers 18.000 square meters of blossom garden and well kept environment. The hotel is closer to the beach than any other hotel in the area (literaly on the beach!) and very close to local shops of Ixia. If you decide to visit us, we will be glad to service you in the best possible way. Our friendly, experienced personel will help you realise your dream holiday in Rhodes! So, get to know us by taking a virtual tour of the hotel, contact us for any type of question we haven't answered here. And remember, this is an All Inclusive Hotel!